Time to get down to business! Joking aside, we’re getting down to the nitty gritty of the subject now. This is one of the most important chapters in the course because it introduces numerous Node.js concepts, most of which will be new to you. You will therefore need to read this chapter in a quiet place, gradually, and it may be a good idea to read through it again the following day to make sure that you’ve understood it correctly. In this chapter we’re going to create a real Node.js app from start to finish. You will find out what "low level" means and we will have to manage all parts of the web server that will handle the visitor’s HTTP requests and give them an HTML webpage. I think I’ve already said it numerous times, but I feel I should mention it again here: Node.js is low level. So low level that you will have to do things that you aren’t used to doing to make your program work properly. Apache manages HTTP requests to connect to the server. Its role is more or less to manage the in/out traffic. PHP runs the .php file code and sends the result to Apache, which then sends it to the visitor. As several visitors can request a page from the server at the same time, Apache is responsible for spreading them out and running different threads at the same time. Each thread uses a different processor on the server (or a processor core) (see next figure). Unlike Apache, Node.js is monothread. This means that there is only one process and one version of the program that can be used at any one time in its memory. But I thought that Node.js was really fast because it could manage loads of requests simultaneously. If it’s monothread, can it only perform one action at a time? Yes, it can only do one thing at a time and therefore only runs on one processor core. However, it does it efficiently, despite the latter, and is still much faster! This is due to the event-orientated nature of Node.js. Apps that use Node never sit around doing nothing. 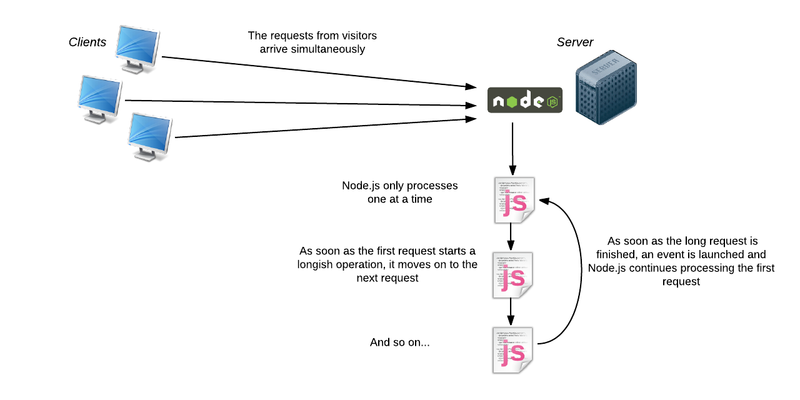 As soon as there is an action that takes a little too long, the program hands over to Node.js, which will carry out other actions while waiting for the event to happen to tell it that the operation is finished (see next figure). In some ways it’s the "minimal code" for a Node.js project. Put it in a file and name it server.js (for example). It creates a mini web server which sends a "Hi everybody" message in every case, regardless of the page requested. This server is launched on the 8080 port on the last line. 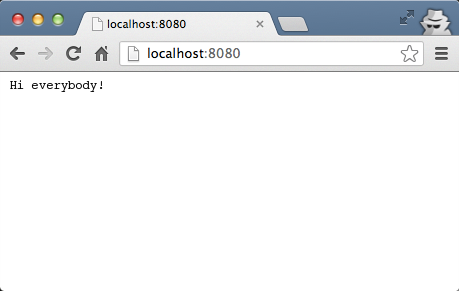 require makes a call to a Node.js library, here it’s the "http" library which allows us to create a web server. There are loads of libraries like this one, most of them can be downloaded using NPM, Node.js’s packet manager (we’ll learn how to use that later on). All this code corresponds to a call to the createServer(). Its settings contain the function to be run when a visitor connects to our website. Don’t forget to close the callback function properly with a brace, to close the brackets that contain the function, and to place the infamous semicolon. This is why you see the }); symbols on the last line of my first code. The visitor’s request (req in my examples): this object contains all the information about what the visitor asked for. In it you will find the name of the page that was requested, the settings, and any fields filled in on a form. The response that you should send back (res in my examples): this is the object that you need to fill to give a response to the visitor. In the end, res will generally contain the HTML code of the page to be sent to the visitor. Next, we end the response (with end()) by sending the message of our choice back to the browser. Here, we don’t even send HTML, just plain text. we avoid using the 80 port here, which is usually reserved for web servers because it may already be in use by your machine. Obviously this 8080 port is only to be used for our tests, once in production it’s advisable to listen to port 80, because it’s this port that your visitors will sail into when they arrive on your server. The console doesn’t display anything and doesn’t respond – that’s totally normal. Now open your browser and go to the address http://localhost:8080. Connect your own machine to the 8080 port on which the Node.js program is running. You should get something that resembles the next figure. Our first Node.js program is shown in the browser! To stop your Node.js server, return to the console and press ctrl + C to cut off the command. The message sent back is in plain text, it doesn’t even contain any HTML. The application always sends back the same message, regardless of the page called (http://localhost:8080, http://localhost:8080/mypage, http://localhost:8080/file/otherpage). For this chapter to be complete, we will need to cure these two problems. Let’s start here by seeing how to send some HTML back. As I said before, there are rules that are to be respected between client and server. They communicate based on the HTTP standard invented by Sir Tim Berners-Lee. 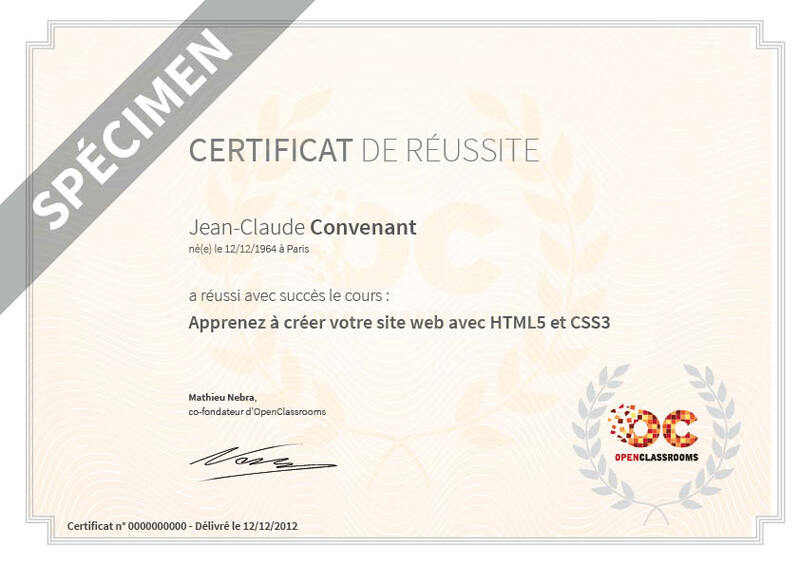 This standard is the foundation of the web (like HTML language, which was also invented by him ;) ). These are what we call the MIME types. They are sent in the header of the server’s response. The second setting is between the braces, because we can send multiple values in grid format. Now that’s done, we can send HTML in the answer! But the HTML code isn’t valid, is it? We didn’t write a doctype or the <html> or <body> tags. We can repair it. It’s easy, you simply need to send all the other tags that were missing. Up to now, we’ve been writing HTML code in res.end(). A better way to divide the code from now on is to use the res.write() command that allows you to write the answer in several stages. It gives the same result, but our code is better divided this way. res.end() must always be called last to complete the response and ensure that the server sends the result to the client. But you can’t write HTML like that, it’s awful! We make do with what we have! We know how to return HTML, but at the moment our app is returning the same thing every time. How do I create different pages with Node.js? ...the page displayed is always the same! We need to know which page the visitor requested. Since we aren’t doing any tests at the moment our app always returns the same thing. The settings in the URL (eg: http://localhost:8080/mypage?lastname=doe&firstname=john). Which page did the visitor request? I only loaded the home page, why am I seeing /favicon.ico? Most browsers actually carry out a second query to retrieve the website icon (the "favicon" generally seen in the tabs). This is normal, don’t worry. Now try to load "bogus pages" of your website to see what happens. So what? My website is still sending me back to same thing regardless of the page called! How about a little test to give you a bit of practice? Get an error message to display if the visitor requests an unknown page. And don’t forget to return a 404 error code! The problem is that the whole string will be returned to you without first dividing the different settings. Thankfully, there is a Node.js module that takes care of it for us, i.e. querystring! You will then have a "params" settings table. To retrieve the firstname setting, just write: params['firstname']. Try going to http://localhost:8080?firstname=John&lastname=Doe to see the result and then change the first and last names to your own! In addition, you will see that I haven’t checked the page that’s called. This code also works just as well on http://localhost:8080 as it does on http://localhost:8080/imaginarypage. This and the previous code should be combined to manage both the page and settings. Let’s sum up what we’ve just learnt in one single diagram (see next figure) before finishing. With Node.js, your app must manage the web server (Apache equivalent) in addition to its own features. It should also determine the name of the page called and its settings so it knows what to return to the visitor. Node.js libraries are called modules and they are loaded using require() . With Node.js, we frequently send functions in settings of other functions. This determines which function should be called next when a task is finished. Your app should usually return HTML to the visitor’s browser using the write() method.